Parents, the school year is upon us. It’s a big transition for the students and the whole family to go from the summer back to school. 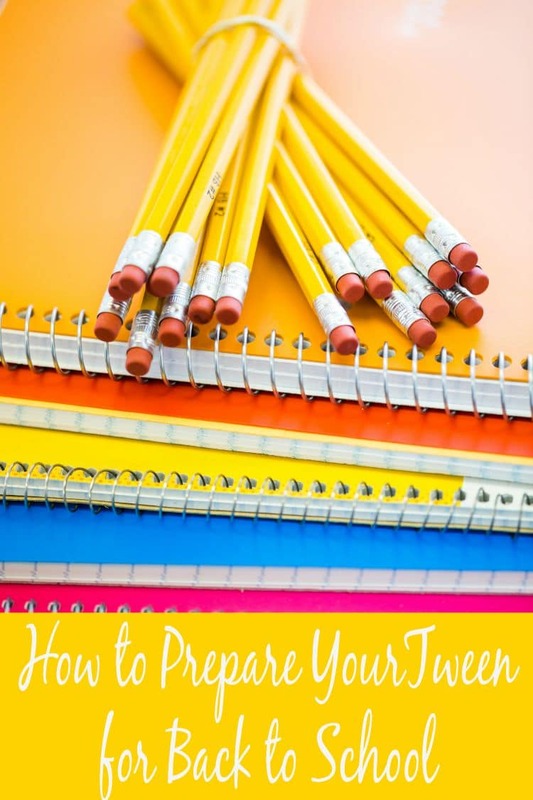 I’m sharing four easy things to consider as you prepare your tweens. What is a tween? A 7-12-year-old, who feels like he’s not a little kid, but he is not yet a teenager. As fun as the summer has been, I have a five-year-old daughter and a 12-year-old son, who will be entering kindergarten and seventh grade, respectively. My son’s first year of middle school, last year, went fantastic! I’ve learned several things to do again (which I shared in my Preparing for Middle School post) and several things to change. Here’s my plan for the upcoming school year, which will be starting very soon. Sleeping earlier – One of the most important things about preparing to go back to school is getting to bed earlier. I don’t know about you, but my kids have been going to sleep later than their usual bedtime. So, a couple of weeks before school starts I start having them go to bed a few minutes earlier and increase that each night, so that when it’s time to go back to school, their bedtime has returned to normal. Waking earlier –Whether they’re staying at Grandma’s house, old enough to stay at home, or one of the parents is home during the summer, most kids sleep in later during the lazy days of summer. Just like putting them to bed a little earlier each night, I have them start to wake up a little earlier so that by the time it’s the first day of school, everyone can get up on time with their alarm. After school – Depending on what is age appropriate in your state and what you are comfortable with, if your child will be coming home after school alone, you will need to discuss your expectations and any rules that you want them to abide by. Some common ones to discuss would be whether or not they are allowed to cook using the microwave or the stove, whether they are allowed to go outside or leave the house, whether they are allowed to have company, and what you would like them to have done before you get home (like chores, homework, reading, etc.). I shared many other tips in my post about†After School Safety. Clothes – Tweens really start to come into their own sense of self and individuality in the middle school years. I think it’s important to allow them to express their personality and shopping for back to school clothes is no different. So it’s a good time to start browsing the stores and see what types of styles they like to see if you feel like they are age-appropriate and if they are affordable for your back to school budget. Back to school supplies – Supplies are pretty standard and I think that the kids usually outgrow character folders, pencils, erasers, etc. However I think it’s important to buy high-quality notebooks that will last the duration of the school year, instead of buying the less expensive options that will have to be replaced before the first school break. After school snacks – Whether the kids are staying home after school, will be enrolled in an organized program, or will be staying after school for sports or extra-curricular activities, a game plan needs to be in place for after school snacks. You guys can discuss what they want, how that can fit into your budget, and get them when you go grocery shopping. They may need to take a few extra snacks with them to school or make sure that your kitchen is stocked appropriately to give them a nice, healthy, and nutritious snack before dinner. Haircuts/hairstyles – Depending on whether you’re doing a whole new style or just getting a haircut, you’ll need to get all of that taken care of no later than the last weekend before school starts. My son’s barber is in a neighboring city, which starts their school year earlier, so we don’t usually have to deal with a long line of others in the back to school rush. Screen time – My husband and I have had several conversations with our 12-year-old son over the course of the summer about what we expect from him during the school year. As we get closer to the start of school, we talk about screen time and how much he will be allowed once school is back in session. We were a lot more flexible and lenient during the summer with screen time; however, we are getting back on track. You may want to consider the American Academy of Pediatrics’ recommendation of no more than 2 hours per day of screen time for kids. Homework – Homework is very important to me. In middle school, they are required to do a lot more independent work and have a lot more responsibility. They’re usually responsible for tracking their assignments and are assigned larger projects that must be worked on in increments up to a due date. When it comes to homework, I would recommend making it clear that homework must be done before leisure time. I usually allow my son to come home and get a snack and relax for 20 to 30 minutes. Then, homework is completed. I think this is great practice for high school, for the real world, and is great to work with our kids on. I check my son’s grades every week just to know where he stands and if we need to work on anything or if any discussions needs to be had with his teachers. Chores – Chores are a very important way to have your tween contribute to the family and begin learning important lessons about responsibility. My son is responsible for vacuuming, emptying all of the trash cans, taking the trash bin out to the curb and returning it to the house on trash pick-up day, cleaning the bathroom, and keeping his room clean. These are non-negotiables that must be performed every week (and more often, if necessary). Focus on the Family has a great list of age appropriate chores. Sport practices and games – Although my son is not playing any sports this fall, in the past when he has, I have learned how important it is to map out practices and games into your calendar. There’s nothing that can throw off your meal plan or other family events like remembering (last minute) that you have a practice to rush to. Then, you don’t have time to cook dinner or take care of other household responsibilities. Not to mention you have to consider the time it takes you to get from work, pick up other children, pick up the player, and get to the practice location. Extra-curricular activities – If your child is participating in any extracurricular activities. It’s also important to get schedules and other event dates mapped into your calendar. This is essential so that you can prepare for transportation, meals, homework, and other responsibilities. Attending sporting events – As I mentioned, last school year was my son’s first year of middle school. Every home game, he and a group of friends went over to the high school (which was which was located directly behind the middle school) for Friday night football games. A local church hosted the kids afterward and parents would take turns dropping kids off after the football game and picking them up at the end of the night. It was a great ritual to have at the beginning of the school year to give the kids some extra time to socialize and support their soon-to-be alma mater. Now that your schedule, supplies, expectations, and calendars are all in order,†it’s time to get back into the routine of the school year. Although there are a lot of changes that will be coming, with planning and preparation you and your kids can have a great school year filled that’s still filled with loads of family fun. Raki Wright is a wife, mom of two (12-year old son and 5-year old daughter), coffee drinker, and list maker. She puts her UNC Tarheelsí degree in Communication Studies to use at an advertising agency and her hands-on experience as a working mom to use on her blog Outside The Box Mom.†Raki†is thrilled to be sharing parenting advice each month, especially for tweens and teens.